Darwen Market Presents…Four Days of Free Freaky Fun! 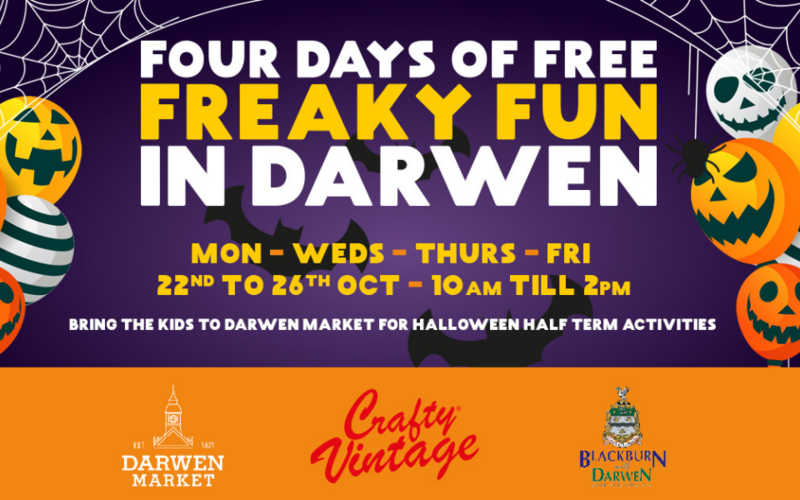 Darwen Market and award winning Crafty Vintage are having four days of free freaky fun this half term. On Friday there will be a Freaky Fancy Dress party, with free face painting and a prize for the winner. We have had very positive feedback from families and market traders alike following the Six weeks of Summer holiday programme at Darwen Market. We want to build on this success and continue to provide free quality family activities, attracting children and families to the fantastic Darwen Market, which is at the heart of the community. Crafty Vintage has lots of events planned all over Lancashire and beyond, but we wanted to continue with the really important delivery of holiday activity in our home town. People were really surprised with the quality of the free activity over the summer and this is something we are proud of. We are aiming to offer visitors to Darwen Market a fantastic experience; giving people even more reasons to keep coming back! This is no trick and will most definitely be a treat…for all the family! For more information visit the Darwen Town Centre site.